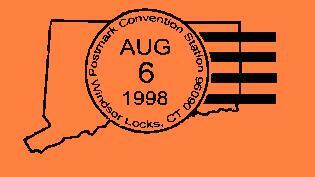 The 1998 PMCC Convention was August 6-9 in Windsor Locks, Connecticut at the Bradley Airport Doubletree Hotel. The theme of the PMCC 1998 convention was "Return to New England" 127 members and guest attended this fun and exciting event hosted by Andy Mitchell, John Flint, Kelvin Kindahl, and John Firtick. Click here to see the schedule of events Click BACK to return here. 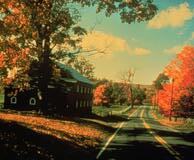 * Scenic tour of Connecticut Towns and Post Offices, including Andy's Post Office in Tarrifville. A bus drove us to 14 different Post Offices around the Connecticut area. The group recieved many strange looks as people noticed the large group taking pictures of the Post Offices! * Train tour of Springfield, Mass. * Banquet on Saturday included Guest Speaker, Gaile Santaline, the Postmaster of Tariffville, CT dedicating the bi-color Trans-Mississippi postage stamp. * Finders-Keepers tables were packed with over 30,000 free hand cancels and other Post Marks! * A silent auction was held on Friday for the convention fund, and the live auction was held on Saturday night raising $3740 to support the Museum. * PMCC Museum tables sold special covers, DPOs, station and branch postmarks. * Wonderful Exhibits made of a variety of themes. Kandace Mercer won the Best in Show award. * Exclusive state lists of operating post offices were available; The only source in the world!. * A 50-year membership plaque was announced for Frederick Langford, member #206! * Gran-Val Dairy brought an ice cream truck to the convention and served delicious home-made dairy-fresh ice cream. * Dave Proulx exhibited a collection of rare and vintage postal history, celebrating 45 years of collecting. It included items such as a cancelled Penny Black stamp from 1837. * The classic 1936 British documentary Night Mail was shown. For historical purposes here are the forms used during the 1998 Convention.